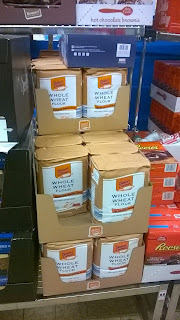 Whole Wheat Flour is back! ALDI has whole wheat flour right now for $2.75 for a 5 lb. bag. I like to stock up for the year so that I make sure I have enough till it comes back. This is way cheaper than the price at other stores in my area. So what to do with whole wheat flour? Use a sifter before measuring so you don't over measure.Let whole wheat flour sit in the wet ingredients to soften. I use this with pancake and waffle batter.Whole wheat yeast recipes will take longer to rise than when you use all-purpose flour so give them time or switch to fast-acting yeast when you work with whole wheat flour.